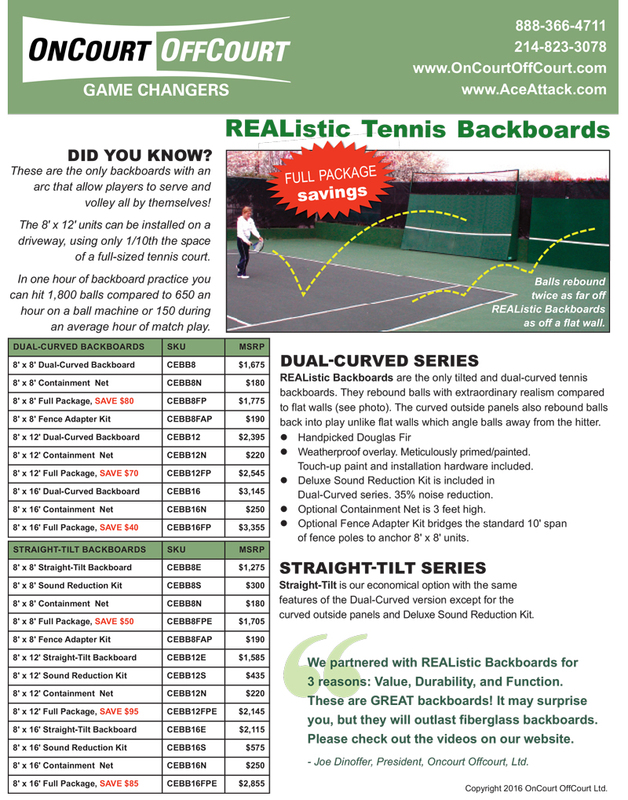 This unique dual-curved and tilted tennis backboard rebounds balls with extraordinary realism unlike the typical non-tilted backboard where balls bounce downward at an unrealistic angle. Curved and beveled framing is crafted from handpicked Douglas Fir. Hitting surfaces are high-quality weatherproof overlay, meticulously primed and painted. Package includes touch-up paint plus hardware (a combination of U-bolts and/or chains) to install against the vertical posts of a tennis court fence. Includes Deluxe Sound Reduction Kit, made from special insulation. Expect noise reduction of 35%. Optional 3-foot Containment Net. Ready to be installed. High quality. The 8' x 12' units can be installed on a driveway, using only 1/10th the space of a full-sized tennis court. Straight-Tilt is our economical option with the same fantastic features of the Dual-Curved version except the curved outside panels and the deluxe sound reduction panels. Same optional 3-foot Containment Net. Ready to be installed. Optional Deluxe Sound Reduction Kit as described above. If needed, we have a Fence Adapter package for $190 (CEBB8FAP), which is designed to bridge the standard 10-foot span of fence poles to anchor 8’ x 8’ units. Click the button below to add the REAListic Backboards to your wish list.